Trees we trim in Grapevine: Chinkapin Oak. This special oak grows native in Texas, but is seldom used as a landscape tree. 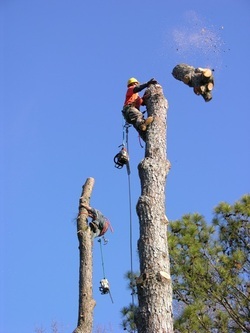 That should change, because we at Justin-Time Tree Service think it's a great tree! Huge specimens exist in various parts of the state. The chinkapin oak has light0-colored bark, yellow fall color, and is fast growing for an oak. The leaves are long ovals with serrated edges. It grows wild in some areas of Oklahoma as well. The chestnut oak is very similar, but doesn't grow as well in Texas. The serrated edge of the leaves has rounded points, combined with the chinkapin oak's sharp, pointed edges.